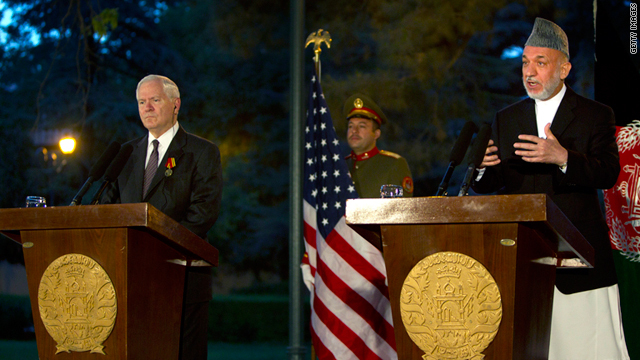 Robert Gates, left, stands alongside Hamid Karzai during a press conference June 4, 2011 in Kabul. (CNN) -- Support from the United States, Pakistan and other Afghan allies is crucial to the success of reconciliation talks with the Taliban, Afghan President Hamid Karzai said in an interview with CNN's Fareed Zakaria that aired Sunday. Last week, outgoing U.S. Defense Secretary Robert Gates said, "there's been outreach (to the Taliban) on the part of a number of countries, including the United States. I would say that these contacts are very preliminary." "My own view is that real reconciliation talks are not likely to be able to make any substantive headway until at least this winter," Gates said. Among the conditions required by the United States of the Taliban: complete disassociation from al Qaeda and "meeting the redlines that President Karzai and the coalition have laid down." Karzai said earlier this month that "peace negotiations with the Taliban and with other countrymen have been started. Those who accept the constitution, freedom, democracy and development of Afghanistan can take part in this negotiation." "The Afghan people need peace," Karzai said in the CNN interview. "The Afghan people want peace. They want their children sent to school. Mothers want to be without worry when they have their children go to school or their husbands to (a) job, or when the women go out to work. This country needs to live like all other nations live." "... We must reach this human desire through a reasonable means, through a realistic approach," he said. "And that is dialogue with a condition that the gains of Afghanistan over the past 10 years not be compromised, that the gains of our women not be compromised, that our children must continue to go to school, that our constitution be respected and recognized. And that having fulfilled that, that the Taliban, who agree to this -- and the absolute majority of them agree to this -- will return to their homes in dignity." Karzai also said he welcomes U.S. President Barack Obama's plans for a drawdown of American troops, calling it a sign that Afghanistan is ready to take control of security in the war-torn nation. "The number of troops that he has announced to be withdrawn is a sign that Afghanistan is taking over its own security and is trying to defend it territory by its own means," Karzai said. "So we are happy about the announcement." As the United States pulls back, Karzai painted a picture of a more stable Afghanistan, despite the fact that May was the bloodiest month for Afghan civilians since 2007. Karzai, who spoke to Zakaria earlier this week, said Afghans were ready to take the reins of their own country. "It is the responsibility of the Afghan people to protect their country and to provide security for the citizens of the country," Karzai said. "If you fail in fulfilling our most important responsibility with regard to our country and our people, then somebody else should take over." Obama announced Wednesday night that 10,000 U.S. troops would leave Afghanistan this year and all 33,000 forces, sent as part of a 2009 surge, would return home by the summer of 2012. Karzai also defended his public criticisms of NATO, which in recent weeks have taken on a more angry tone. Karzai blasted the alliance for civilian deaths and nighttime raids. He said his comment on NATO becoming an "occupying force" was taken out of context. "The question was what if they continue?" Karzai said. "When Afghanistan asks that these operations cease and even then, if they continue, this means we are not in charge of our country," he said. "And that, of course, becomes an occupation. It was in this context that I spoke, and I stand by that." "My statements are neither hostile nor inflammatory nor designed to get anything but an understanding from our partners that the Afghan people need to feel secure, they need to see this war take a direction in which they can see the end of the tunnel," Karzai said. He said Afghanistan, dependent on U.S. dollars for security and development, was grateful to American taxpayers but expressed dismay that U.S. humanitarian efforts have not always taken Afghan wishes into account. He cited a Kandahar electricity project in which he said the United States spent $250 million to buy generators. Karzai said Afghanistan would have preferred the construction of a dam, which he called a more lasting solution.